Discover Arezzo and Cortona: enjoy your tour with a private guide! 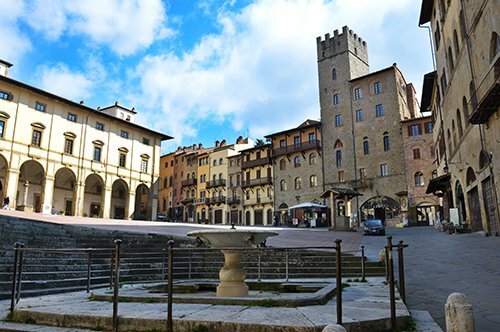 WHY VISIT AREZZO AND CORTONA? 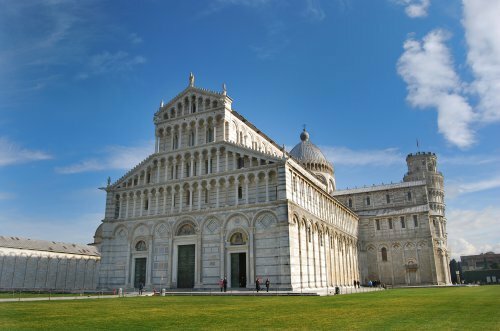 Why visit Arezzo? Because you can discover a territory that offers a vast naturalistic and artistic heritage in a concentrated area. Discover Arezzo walking through the heart of the medieval village and admire its architecture, the works of Giorgio Vasari and Piero Della Francesca that have always been historical "testimony" of Arezzo with its artistic and architectural remains. Why visit Cortona? Because it is a fortified town among the most famous of Valdichiana. Because it is considered one of the best preserved medieval cities from the architectural point of view that rests on a hill from which you can admire the Valdichiana. Because Cortona will remain in your heart with its charm of the Etruscan town. AREZZO: Arezzo is a very old city, older than Alexandria in Egypt and that is why it is worth knowing its past. Arezzo was one of the main Etruscan settlements and later became a strategically important Roman center with a flourishing economic activity. It was famous for the production of bricks and ceramics painted in red. In the Middle Ages, the expansion of Arezzo was stopped by Florence. After the battle of Campaldino in 1289, the independence of the city ended and, despite some economic recovery, Arezzo became a Florentine territory and became part of the Medici domain since 1384. Even though World War II destroyed part of the medieval city, the center of Arezzo preserves wonderful monuments, churches, palaces, and museums. Many famous people were born in Arezzo, among them Giorgio Vasari, Piero della Francesca, Guido Monaco, Francesco Redi, and Petrarca. CORTONA: the history of Cortona goes back to the Etruscan civilization that exploited the strategic position of the city to control the adjacent territories and to protect it from enemy attacks, it built the imposing defensive walls. After the arrival of the Romans and their subsequent occupation, a period of instability began that lasted during the 1st centuries of the Middle Ages. At the beginning of the second millennium, Cortona became a free municipality, but the alliances and wars with other cities in the disputes between Guelphs and Ghibellines did not take long. From the 15th century, Cortona fell under the rule of Florence and its Renaissance artistic influences. In the following centuries the historic center of Cortona was enriched with beautiful architectural works, until the Risorgimento (Italian Unification), the city was the subject of political and territorial disputes between foreign powers. In the 20th century, Cortona developed economically with the breeding of Chianina cattle, with agricultural and manufacturing production. In recent years, tourism has also grown with rural tourism farms and structures linked to the territory of Valdichiana. Cortona offers not only historical-artistic beauties but also many outdoor activities. WHAT ARE AREZZO AND CORTONA NOWADAYS? Arezzo is a city full of ancient traditions, next to the last Saturday of June or the first Sunday of September, the Piazza Grande becomes the setting for the "Giostra del Saracino" (Saracen Joust), a knightly tournament of medieval origin. The first weekend of each month, in this square and a large part of the historic center is also celebrated, the Antiques Fair, a market of surprising objects where it is possible to practice the "art of negotiation", bargaining the price! Cortona is a small medieval village in the Valdichiana, in the province of Arezzo, surrounded by a wall where it is still possible to see some Etruscan and Roman features. Cortona was built on a hill and its elevated position guarantees an excellent view of the beautiful landscapes of the Valdichiana. 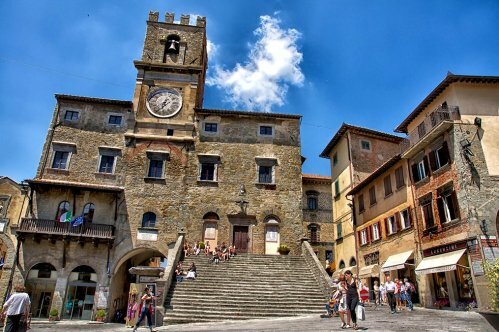 The symbol of Cortona is the town hall, with the clock tower and the stone staircase that overlooks the Piazza della Repubblica. Did you know that the Basilica of San Francesco (Basilica di San Francesco) is one of the oldest and most beautiful churches in Arezzo? This Gothic building from the 13th century was rebuilt in the 14th century inspired by Franciscan aesthetic simplicity. Inside it is possible to admire the frescoes by Piero della Francesca that represent the fifteen scenes of the Legend of the True Cross (Leggenda della Vera Croce), completed in 1466. Access to small groups of visitors is now possible to admire this valuable heritage, a Renaissance masterpiece of inestimable value. 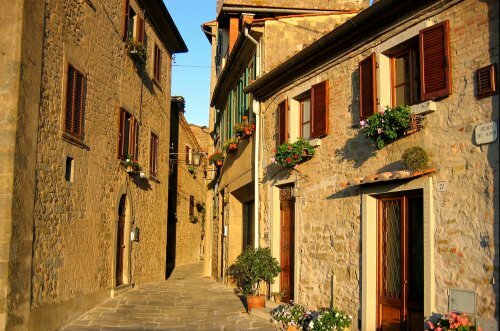 Did you know that the walls of the city of Cortona have 6 doors? This is a sign of how old are the origins of the city. The doors are Porta Sant'Agostino, Porta Berarda, Porta Bifora, Porta Colonia, Porta Montanina and Porta Santa Maria. Of these doors, only Porta Bifora is of Etruscan origin, while the others are medieval or Renaissance. 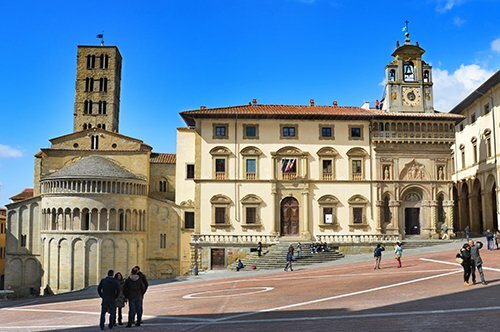 We offer you an itinerary to organize your visit to Arezzo and Cortona: The first day we propose you as the starting point the Piazza Grande of Arezzo, also known as Piazza Vasari. The Piazza Grande is located in the heart of the city, is one of the most beautiful squares in Italy and is surrounded by buildings from different periods that go from the Middle Ages to the Baroque. In the square, there are other medieval buildings such as the Tofani Palace and the Torre dei Lappoli, while on the North side is the Loggia Vasari. 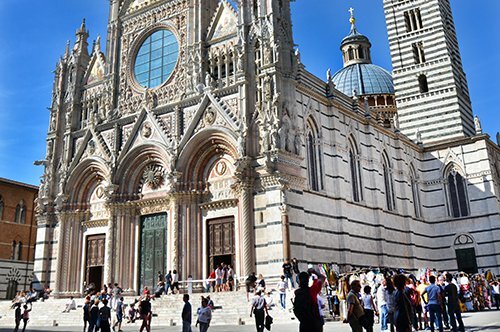 In the highest part of the city is the Duomo of Arezzo, dedicated to Saint Donato, a construction that began in the 13th century and ended after 1500, with a facade of the 20th century. Inside the church, divided into three naves, it is possible to admire the stained glass windows made by Marcillat and The Maddalena by Piero della Francesca. In the Colle di San Donato is also the Medici Fortress, which is an example of a defensive military architecture of the 16th century. The forts of the Fortress are a panoramic point of the city from where you can admire the Arno Valley, the Pratomagno and the Alps of Catania. One of the treasures of this beautiful city is located in Piazza San Francesco, where, inside the Basilica of the same name, it is possible to admire the extraordinary frescoes of the Legend of the True Cross by Piero della Francesca. Another church that deserves to be visited is Santa Maria della Pieve, known by the inhabitants of Arezzo as "The Pieve” (The church), a masterpiece of medieval Romanesque sculpture, with a beautiful facade with columns. The second day start your itinerary with a small 40 minutes trip to Cortona. Start your visit to the historical center that develops around the Republic Square where the Communal Palace is located. Cortona is a small city that offers several interesting things to visit, such as the Diocesan Museum where it is possible to admire a beautiful panel of the Annunciation of Fra Angelico, the Museum of the Etruscan Academy and the City of Cortona, where you can discover many findings from the Etruscan time. You can also visit the beautiful Sanctuary of Santa Margherita and the Fortezza del Girifalco (Fortress of Girifalco), which are located at the highest point of the hill, which can be reached by walking along a fairly short but uphill path. Following the path that runs through the walls of the city, you can admire the beautiful view of the surroundings. The Fortezza del Girifalco, built for military purposes, can only be visited in part due to the alterations suffered over the centuries. Walking through the streets and alleys of Cortona you will find several small shops selling handicrafts and local cuisine, all located on the main roads. 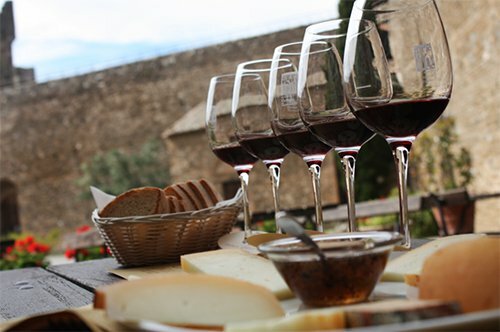 In the area there are excellent wines for which there is no shortage of wine shops, therefore, stop and taste the traditional local and Tuscan cuisine in the company of a good wine!